​The University of the Philippines College of Music presents a special concert on Friday, February 14, 2014, 6:30 pm, Abelardo Hall Auditorium, which extols the voice of the poet who is heard in the creation and performance of the art song genre. 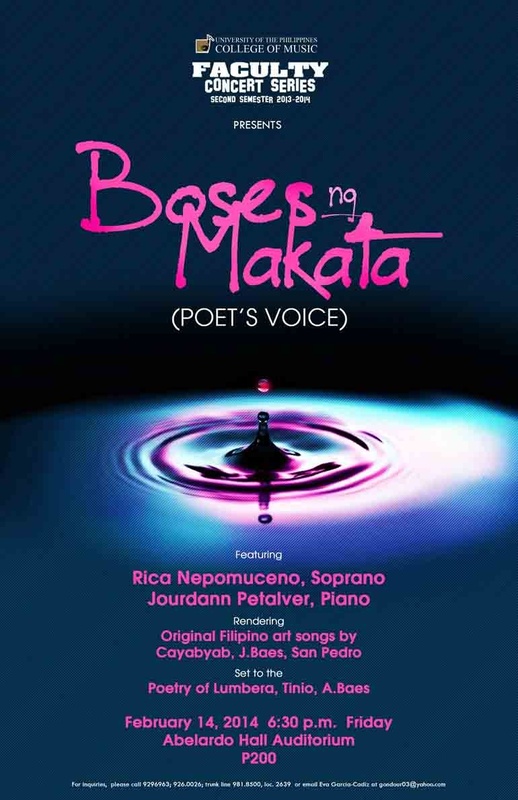 The concert features Ms. Rica Nepomuceno, an Italian-trained soprano and teacher of voice in UP College of Music. She will interpret a rare program of all-Filipino art songs set to the varied poetry of National Artist Bien Lumbera, Marra Lanot,Aloysius Baes, and Rolando Tinio. Ms. Nepomuceno will be accompanied on the piano with pianist Jourdann Petalver who also trained in Italy and who teaches in the College. ​The art of song is a marriage between poetry and music. Words (the medium of poetry) carry the poet’s voice which is separate from the voice of the song’s narrative’s protagonist in whose voice the singer, in turn, attempts to relive in performance. It is this complex layering of voices that makes the appreciation of art song a challenging act of listening for the singer is but a medium for the different kinds of voices emanating from the text and melodies. Students in literature are strongly encouraged to contemplate and relish on this fusion of voices by the poet, composer, and singer. ​Admission ticket to the concert on February 14 is Php 200. Students with valid IDs are entitled 50% discount and senior citizens, 20%. For details please cal 929-6963 or 981-8500 loc 2629 or email Eva at gondour03@yahoo.com.